One aspect of interior design that I truly enjoy is totally changing the look of a home. Over the past few years, the rising property prices, has made some clients rethink their idea of moving house and have instead decided to invest in doing up their current home. The change in both the use of the space and the style of the furnishings can be astounding. In this village house, the clients wanted a complete change from classical to contemporary. They loved their spacious home and recognised the potential of the wide hallway and well thought out layout. However, the house was looking dated and was in dire need of change. Our concept for the interior was to keep some of the classical elements and contrast them with contemporary pieces. Texture and surface interest form an integral part of the concept, and we used natural linens, soft wool carpets, luxurious velvet and panelled walls throughout the interior. The old fireplace in the living room was previously housed in a limestone corner unit, and is now clad in a textured travertine that softly blends into the linen wallpaper. The corner sofa is upholstered in a heavily woven linen blend and walnut coffee tables echo the concept of surface interest. The curtains were kept simple, in white with a deep edge of blue velvet. A heavily patterned blind adds interest at the window. The large carpet was custom made to tone in with the linen wallpaper and two blue upholstered stools add a punch of colour and additional seating. The colours of the room are brought together in a painting that is hung off-centre to add balance to the interior. The lighting was designed to enhance the focal points, with coloured glass pendants over the coffee table and accent lights over the painting. We kept some classical elements and emphasised the large hallway by keeping it white. We added panels on the wall for interest and offset the monochromatic scheme by placing a contemporary black stove in front of the panels. The central location of this stove effectively means that it heats up the entire home. 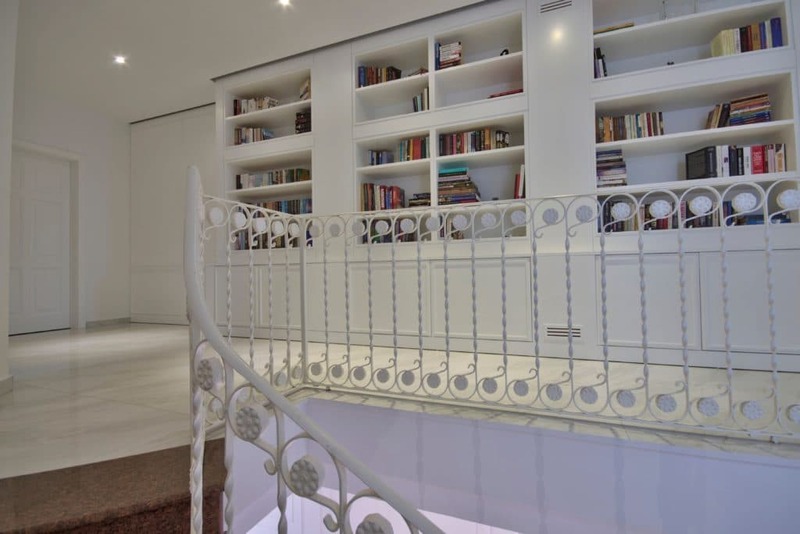 The pipework is concealed within a custom made bookcase at first floor level that houses the family’s eclectic collection of books. Again, the panels add surface interest using white on white to keep the colour scheme simple and elegant. Bathrooms were ripped out and replaced. 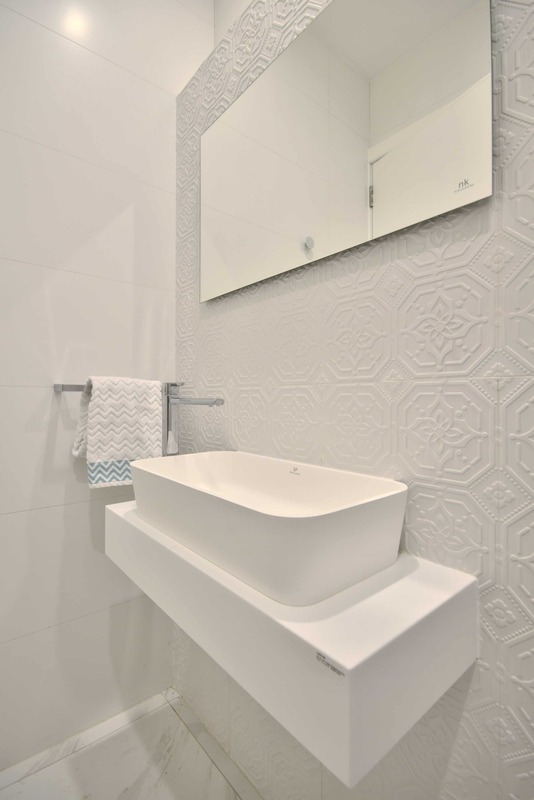 On the ground floor, a white tile simulates the old Maltese tile pattern, using only white, and this is used as a feature behind the wash hand basin. 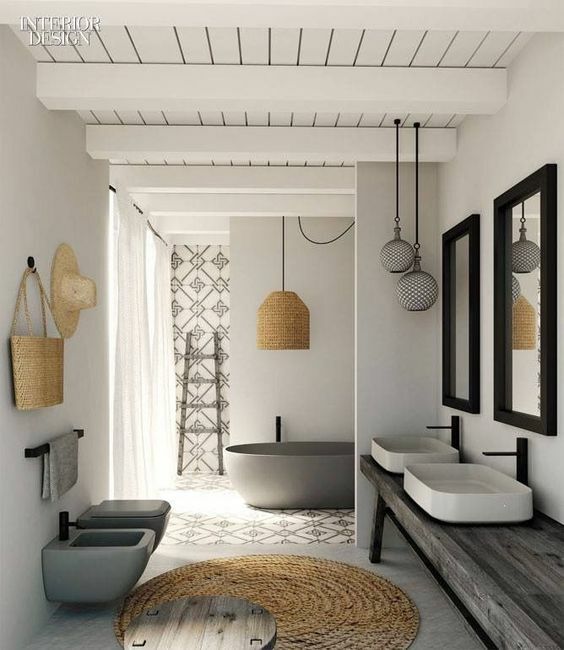 At first floor level, the bathroom is more elegant, with a raw timber effect adding drama to the stepped up bath and again being used as a backdrop behind the bath. 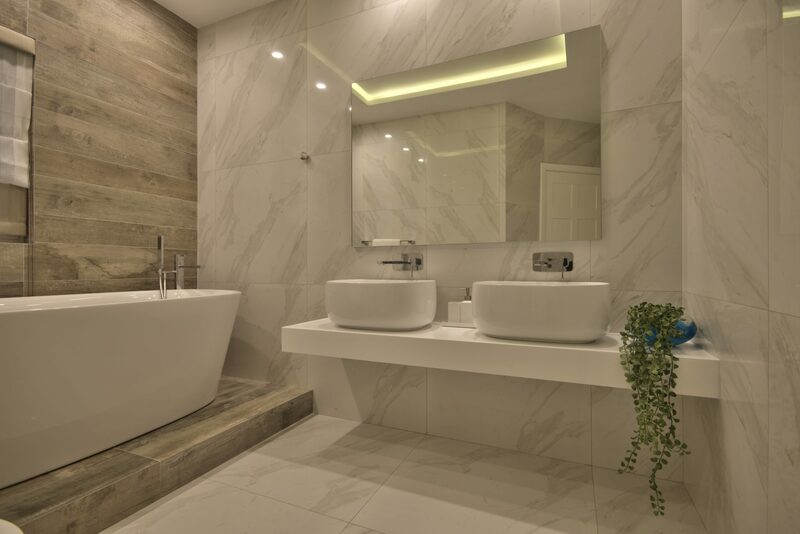 Large mirrors reflect the light, while two deep basins emphasise the luxury in this space. 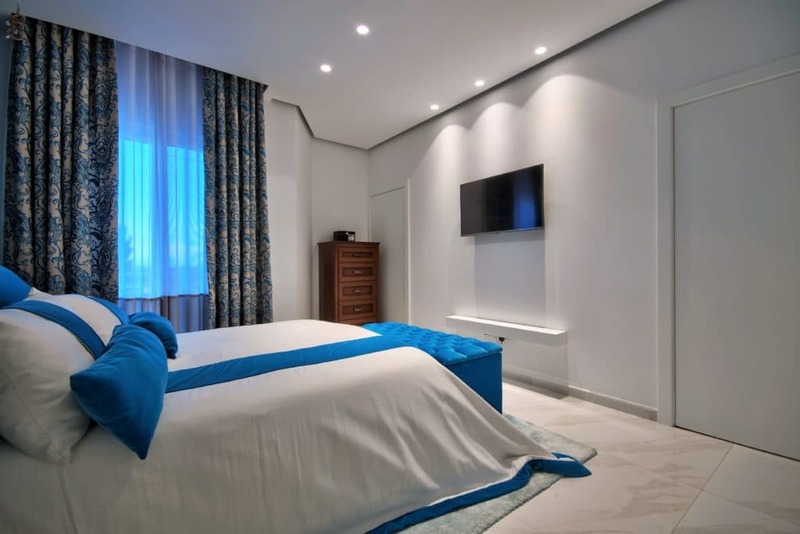 The main bedroom was redecorated in a vivid blue against a clean white background. Floor to ceiling drapes, a deep blue wallpaper and luxurious bed linen edged in soft velvet complete the concept. The room now features an extensive walk-in-wardrobe and an en-suite with walk-in shower. 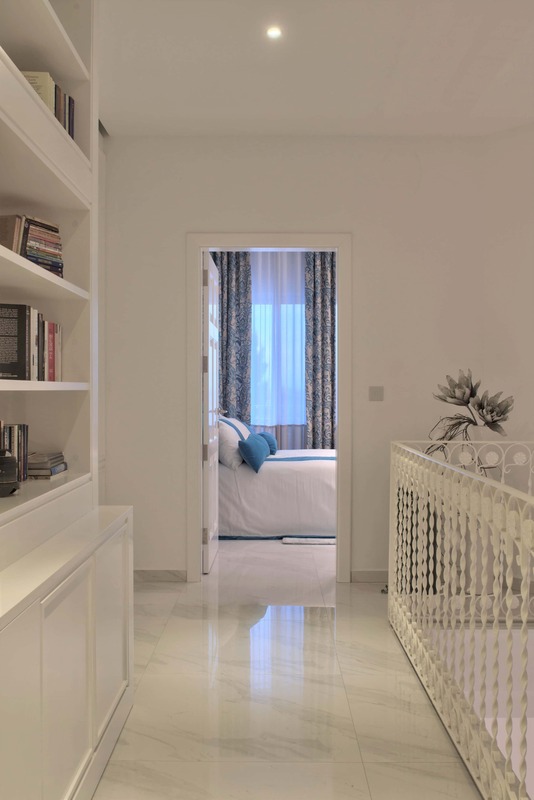 Before starting any project, we look at the rooms in a home with fresh eyes and an open mind, seeing the rooms as areas of potential, to be sculpted around your individual needs. 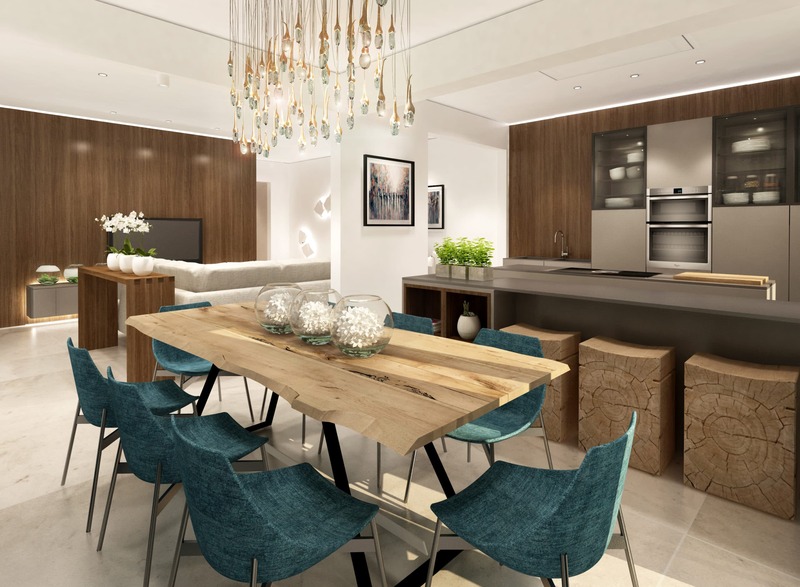 Prior to commencing the design of your space, your design team needs to fully understand your needs, designing an interior that meets and exceeds your expectations. 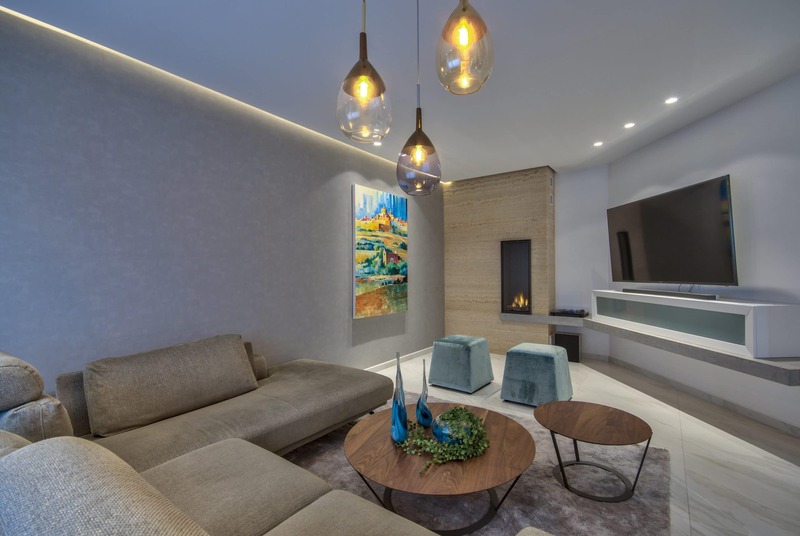 As interior designers, we think from the human aspect about how to use the space – catching little nuances that make the project function without losing any of its aesthetic value. 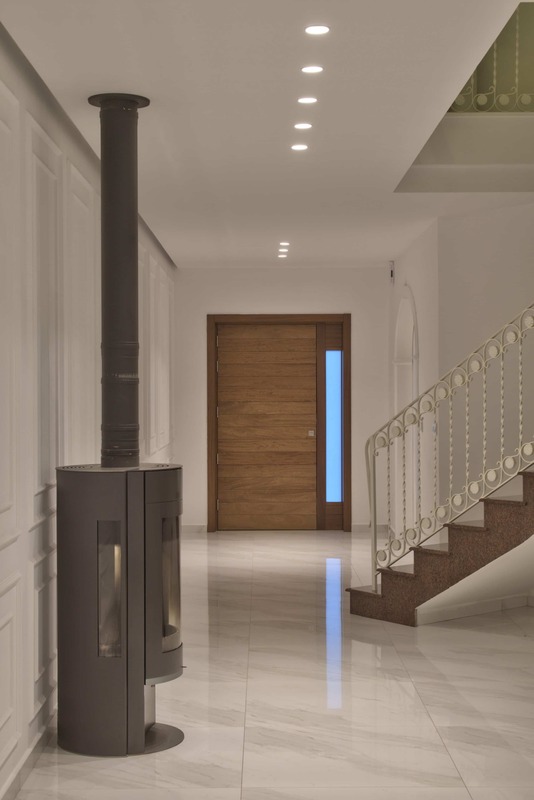 At Kristine Bonnici Design, we are proactive in communicating our specific knowledge in areas of design that could positively impact the architectural solution. Clients today look for a design partner who has experience with a particular project type, who can understand its complexities and who can successful address design challenges. Before moving house, think about the potential of your existing home. After all, it must have some positive aspects, otherwise you probably wouldn’t have bought it in the first place!